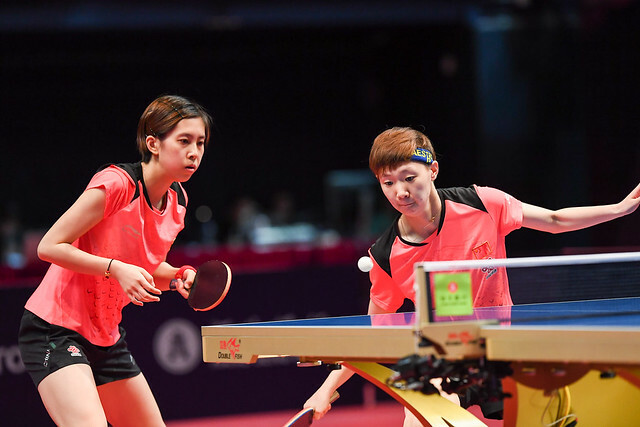 A player who commenced proceedings in the qualification stage and ended the tournament on the top step of the podium when the curtain closed is unusual but it has happened; however, in what is now 329 ITTF World Tour tournament since the concept began in 1996 and, if you wish you can add a further 16 ITTF Challenge Series events, never before have all four semi-finalists been players who were required to compete in the preliminary phase. In the Men’s Singles event at the Seamaster 2018 ITTF World Tour Hang Seng Hong Kong Open; such was the outcome following the quarter-final round on Saturday 26th May. Zhou Qihao, the only Chinese player remaining, the young man who had impressed in the San Juan Convention Centre in the Caribbean island of Puerto Rico in January 2010, when he won the Boys’ Singles title at the ITTF World Cadet Challenge, set the round in motion. He beat Sweden’s Jon Persson in five games (15-13, 11-9, 11-7, 9-11, 11-2). Two qualifiers but it was a surprise outcome, presently Zhou Qihao has no world ranking, Jon Persson is listed at no.68; most certainly the ensuing contests were surprises as seeds were put to the sword and brothers experienced contrasting fortunes. Japan’s Maharu Yoshimura, the no.9 seed and elder brother was beaten by Korea’s Cho Seungmin (11-7, 11-7, 11-1, 9-11, 10-12, 6-11, 11-5), a player who showed signs earlier this year that such a performance was in the offing; he won the Under 21 Men’s Singles title at the 2018 ITTF Challenge Spanish Open in Guadalajara. Defeat against the odds for Maharu Yoshimura, for younger brother, Kazuhiro Yoshimura, it was the reverse scenario. He caused arguably the biggest upset of the round. Certainly he could lay claim to receiving the accolade of the performance of the round. He beat Lee Sangsu, like Cho Seungmin from Korea Republic and the no.2 seed, in four straight games (20-18, 11-6, 11-9, 11-9). Impressive from Kazuhiro Yoshimura, in the immediately preceding contest it had been the same from Lee Sangsu’s colleague, Lim Jonghoon, the winner earlier in the year at the ITTF Challenge Series Polish Open but in Hong Kong had given no hint that he may make such progress. In his first match of the tournament, the top seed, he had been beaten in the opening round of the Under 21 Men’s Singles event by Japan’s Yukiya Uda (11-9, 11-7, 4-11, 11-5). Now accustomed to the surroundings, it was a different story three days later; he accounted for Portugal’s Marcos Freitas, the no.4 seed, in six games (11-9, 11-3, 10-12, 11-8, 7-11, 11-9). A surprise maybe not; last year in the same round as in Hong Kong at the Seamaster 2017 ITTF World Tour Korea Open, Lim Jonghoon had beaten Marcos Freitas in five games. At the semi-final stage Zhou Qihan meets Cho Seungmin; Lim Jonghoon opposes Kazuhiro Yoshimura. The matches will be played later in the day.